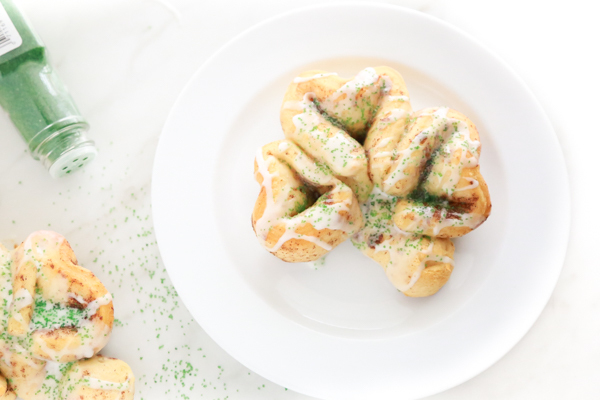 Start St. Patrick’s Day off right with these Easy Shamrock Cinnamon Rolls made with refrigerated cinnamon rolls you can purchase from the grocery store. It doesn’t get much easier than this, folks! I love homemade cinnamon rolls but I don’t love the time involved in making them. With our busy lifestyle it’s normally just easier for us to buy refrigerated dough from the store. 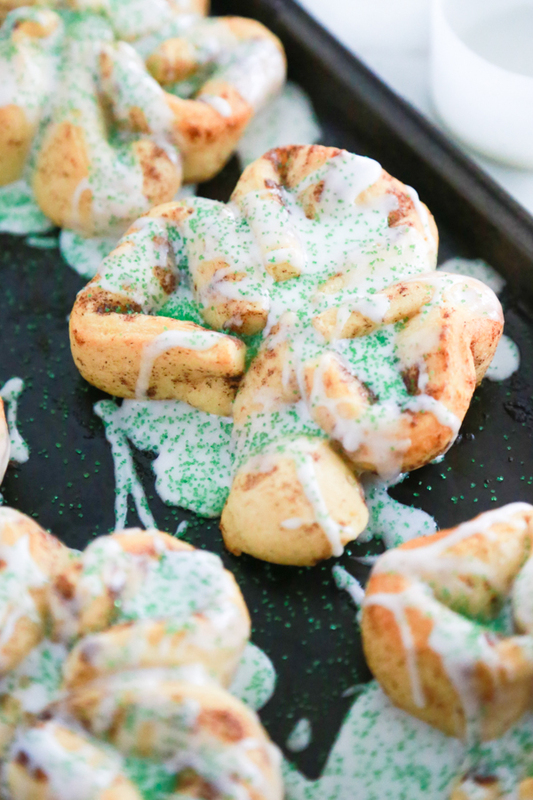 And that’s exactly what I did with these Easy Shamrock Cinnamon Rolls. Y’all, when I say easy, I mean easy. If you’re not a fan of store-bought cinnamon rolls that’s okay. 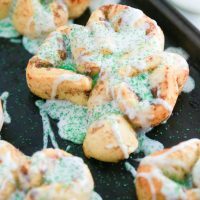 Feel free to make your own dough and them shape them to make these fun St. Patrick’s Day cinnamon rolls. 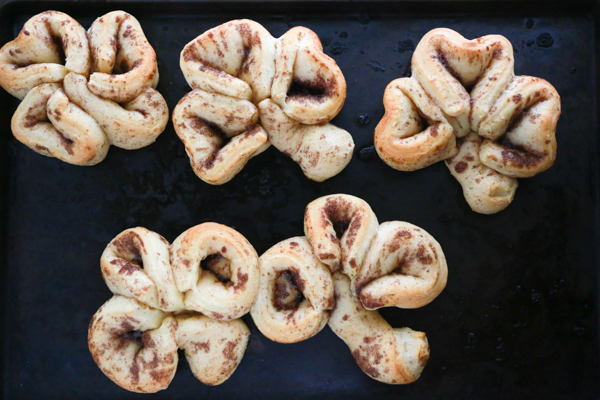 I love taking cinnamon rolls and forming them into different shapes for certain holidays. Some holidays are easier than others, but in the end, I think they’re a great way to enjoy a seasonal breakfast in a special way. I learned when I first starting deconstructing cinnamon rolls that they are not all created equal. There are certain brands and varieties that are not easy to unroll and some don’t unroll at all. I’ve found Pillsbury Grands Cinnamon Rolls to be the best option for making different shapes. 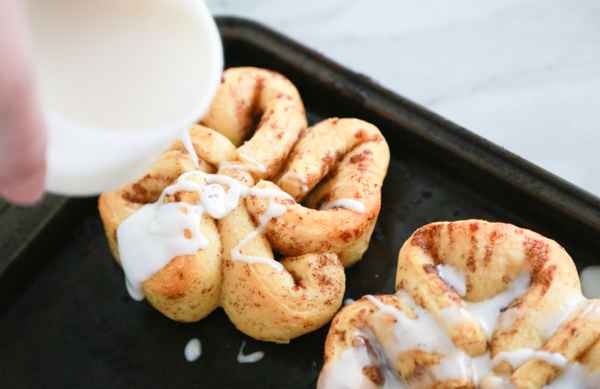 Open the can of cinnamon rolls and unroll each cinnamon roll onto your baking sheet. Cut each strip of dough into 4 pieces. You can use kitchen shears, pizza roller, or knife. Either of these are a great option. Place one piece down as the stem. Take the remaining 3 pieces and fold in half so that you have a loop. Put the 3 loops down on the top of the “stem” and push the tops of the loops inward to create a heart shape. 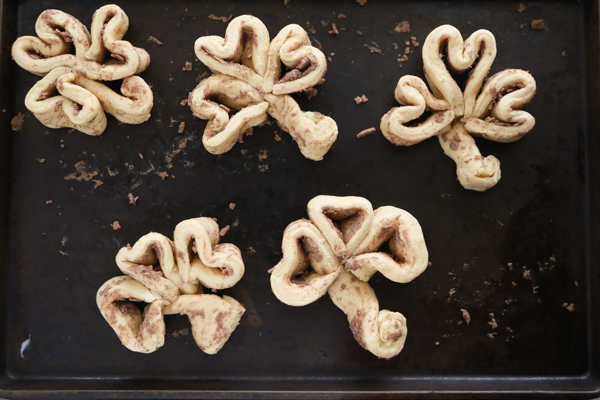 Note: If you want to make a 4-leaf clover, you can cut each cinnamon roll into 5 pieces. Once each of the cinnamon rolls are cut and shaped, place in the oven for about 6 – 9 minutes or until golden brown. While the cinnamon rolls are in the oven, melt the icing in the microwave if it isn’t already melted. Once the cinnamon rolls are baked through, remove from oven. 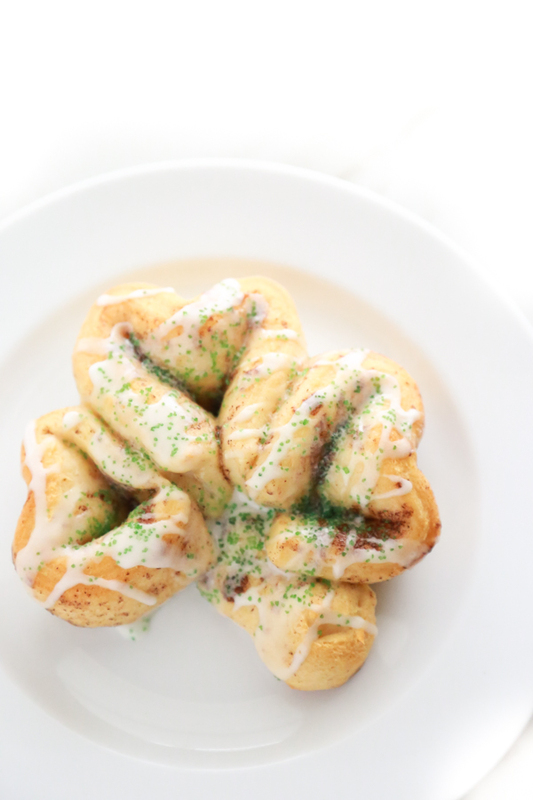 Drizzle icing over the top of each shamrock-shaped cinnamon roll. Next, pour the green sprinkles over the top of the icing. 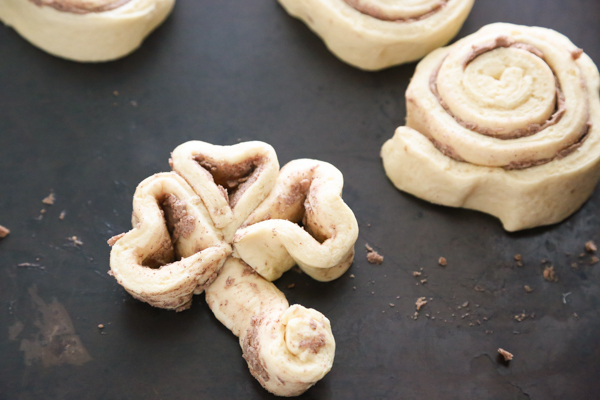 Shamrock Cinnamon Rolls are best served warm right out of the oven. But don’t take my word for it. Try them yourself! 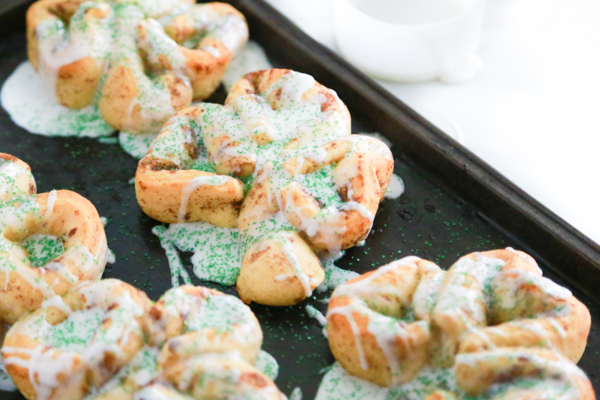 Start St. Patrick's Day off right with these Easy Shamrock Cinnamon Rolls made with refrigerated cinnamon rolls you can purchase from the grocery store. It doesn't get much easier than this, folks! Open can of cinnamon rolls, set icing aside and unroll each cinnamon roll. Cut each cinnamon roll into 4 pieces. Bake for about 6 - 9 minutes or until golden brown. Remove from oven, drizzle icing over the top of the shamrock cinnamon rolls and then add green sprinkles over the top. 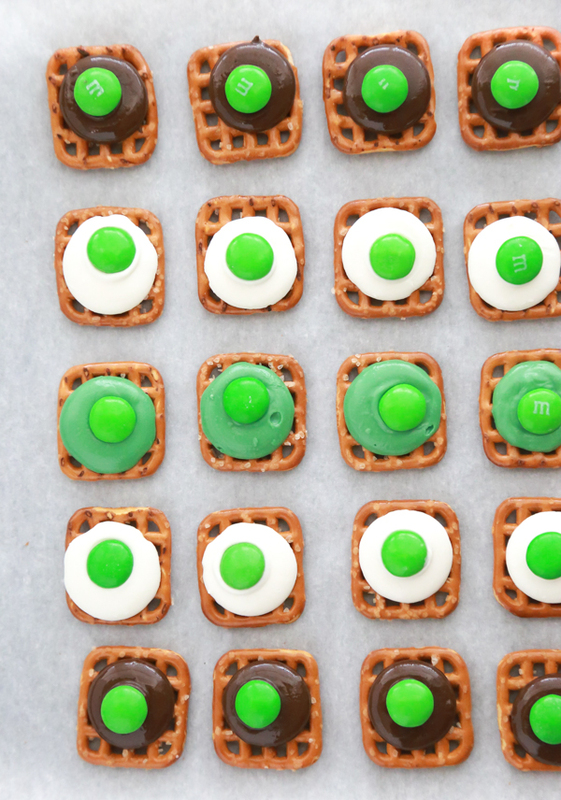 Don’t forget to pin these to your St. Patrick’s Day board on Pinterest so that you’ll be able to easily find it again. 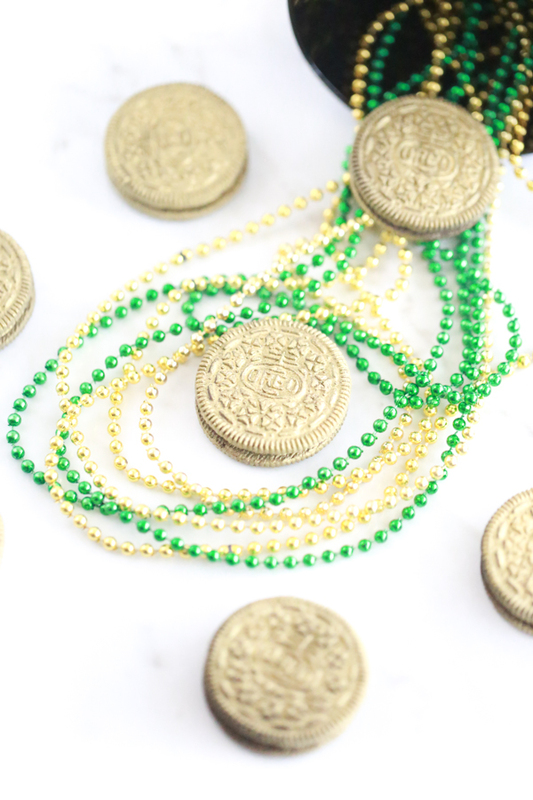 If you’re not following me yet on Pinterest, make sure to follow me because I’m pinning lots of yummy treats you don’t want to miss. I apologize if at first I thought it was shrimp (lol) but I blame my poor vision. Anyway, the cinnamon roll look so good and I think I would be able to make these. Definitely saving your recipe. I love a good cinnamon roll. Sometimes I just eat one with a side of sausage when I go out for breakfast with my grandfather.